We never rest on our laurels here at Apache. We’re always on the lookout for great new British brands, and this month we’ve introduced two of them: Gym King and Sik Silk. We’ll be rolling out new styles on a weekly basis to whet your appetite, so watch this space! 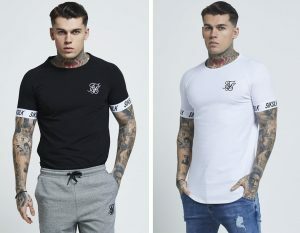 Gym King has exploded in popularity in recent years, with it’s amazing range of fitness fashion and leisurewear earning plenty of new admirers. From slim fit T shirts to full tracksuits, we’ve got something to suit every sporty gent. Sik Silk started out as a humble “bedroom brand”, and has since grown to UK-wide fame. Their fantastic collection of T shirts are perfect for summer holidays abroad and warm days at home. To claim a 10% discount on both of these superb brands, type in SUMMER18 at online checkout. 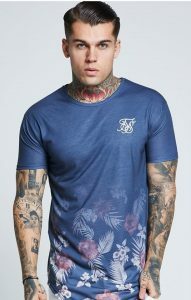 Boasting a faded floral print and classic curved hem, this new Sik Silk T shirt has proven a hit with customers already. Sik Silk designs always carry a global influence, as seen here in the tropical print. The embroidered logo on the chest is unmistakable as ever. Sizes range from Small to Extra Large. 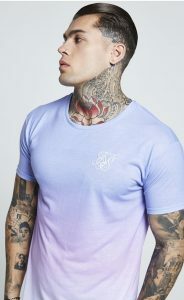 Sik Silk use a bold choice of three faded colours (sky blue, pink and white) to create a memorable triple-fade T shirt. There’s the usual curved hem and semi-slim fit which compliments sportier guys. Perfect with a pair of super-stretchy Hyperflex jeans for an unbeatable summer outfit. Available in a wide range of sizes from Extra Small to Extra Large. Simple but striking, this raglan sleeve T shirt is one of our favourite Spring Summer 2018 designs by any brand. Stretchy cuffs mean you’ll be satisfied with the fit no matter how large your biceps are — perfect for “well built” guys who prefer not to wear a large-than-normal size. One of the best new Sik Silk garments out there. 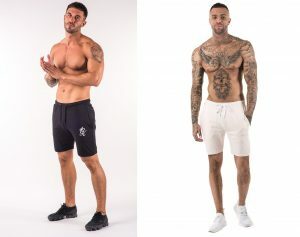 These soft, lightweight jersey cotton sweatshorts by Gym King are made with a hint of stretch for the most comfortable fit possible. Choose from two colours — Black and Shell — in a range of sizes from Small to Extra Large. You’ll be just as happy wearing these on the beach as when you’re out jogging. Featuring two side pockets so you can carry around any loose change at a beach party or BBQ. There’s matching T shirts as well if you feel like the full outfit. 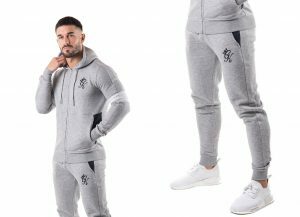 Gym King are well known for their retro tracksuit outfits, and we’re proud to stock an incredible five different styles! 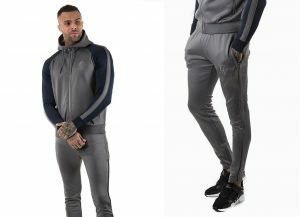 This zip through hooded tracksuit top in Grey is our top pick this summer, boasting elasticated cuffs, a drawstring-adjusted hood and soft fleece lining. The cut and sewn navy and white panels stand out from the rest, and for an added flourish there’s Gym King branding on the zip and collar taping. The jogging bottoms also have a soft fleece lining, as well as an adjustable waist. Available in Small to Extra Large. This reflective GK logo on this poly tracksuit shines in the dark — it has to be seen to be believed! Once night time falls, your outfit takes on a whole new complexion, with reflective piping to boot. Both the hoodie top and the joggers have zip pockets for added security, making this outfit suitable for anywhere and everywhere. Choose from Small to Extra Large.